Are you bold enough to add a little orange to your life? In celebration of All Hallows’ Eve, this week’s blog post is about a BW favorite: the color ORANGE! Orange, a color of happiness! Many people either love it, or hate it until they know the right way to use it. This lighthearted color can make its way into pretty much any interior space when used the correct way. 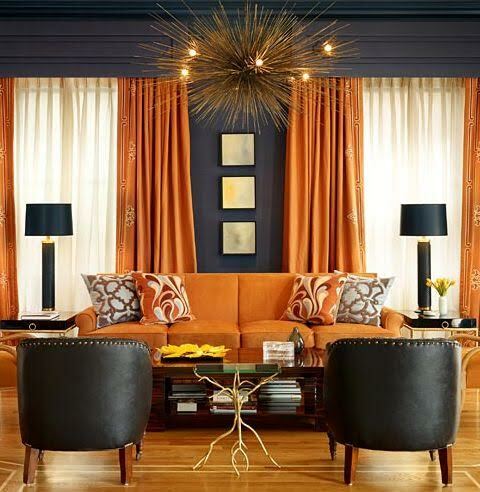 Orange is one of those colors that can bring a fun and dynamic style to any room, whether it be through accent walls, decorative accessories, or even a piece of furniture. This interesting color has a history of encouraging lively attitudes and positive feelings. Another frequent use of the color orange is in the construction industry. It’s a color we all recognize when it’s a time to proceed with caution or slow down while driving. I find it interesting that orange gives use a sense of caution and also happiness in different applications. It’s one of the few colors that represent so many different feelings. That’s just another example of how transformative the color can be, depending on the application. Lastly, orange is frequently used in the retail industry. How many products do you see everyday that use the color orange to grab your attention? Smart! Since orange is used frequently as an alerting color, who wouldn’t see someone’s product with an orange label? With the colors energy and brightness it has so many positive uses. Are you bold enough to add a little orange to your life? Happy Halloween from the BW Team!